Friday, August 17, 2018 — Click here to view this release on our website. 21% admit to being addicted to their Smartphone, and overall weekly usage has increased 20% since 2014. Vancouver, BC — Two-thirds of British Columbians (66%) say their smartphone plays a “very important” part in their lives, a significantly higher majority than what was revealed in our 2014 Smartphone Insights Report (57%). The latest figure includes an alarming number of owners (21%) who are self-admitted smartphone addicts. Our online survey of a representative sample of 816 British Columbians examines smartphone behaviours and attitudes and looks at the impact of these devices on traditional media consumption. 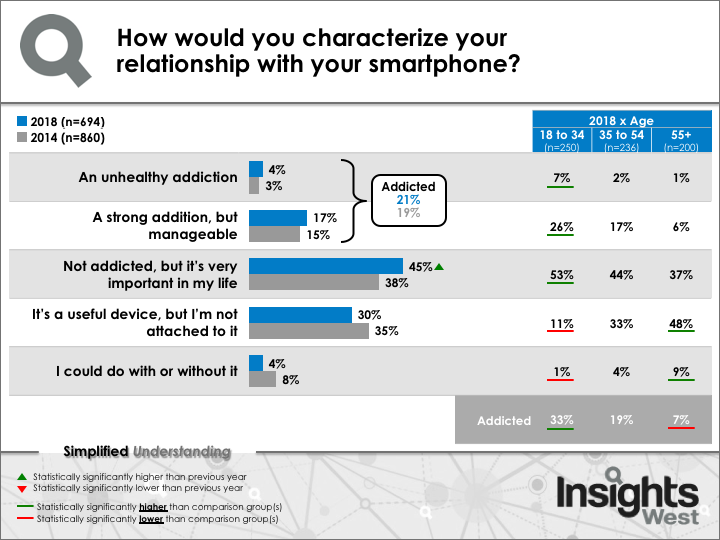 While only a small percentage of smartphone owners in BC (4%) describe their relationship with these devices as an “unhealthy addiction,” many (17%) describe it as “strong, but manageable.” This represents a slight increase since our 2014 poll, where 19% (3% “unhealthy”, 15% “strong”) identified themselves as addicts. This figure continues to be much higher among 18-34 year olds, with a third (33%, +3 since 2014) admitting to their smartphone addiction. 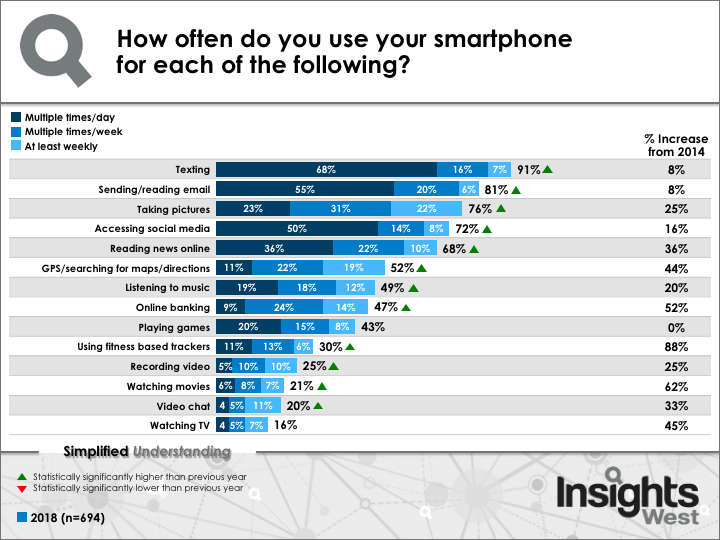 Significant differences from our 2014 poll can be seen in the increased number of those that describe their smartphones as being “very important” in their lives (45% vs. 38% in 2014) and in the decreased number of those that “could do with or without it” (4% vs. 8% in 2014). Smartphone ownership in British Columbia is now near universal, growing by 25% over the past four years to the point where 85% (+17) of residents, including 95% (+2) of those aged 18-34, now report owning one. During this same time period, landline ownership has fallen by a similar proportion (down 23%) to where only three-in-five British Columbians (57%, -17) now possess home phones. The amount of time British Columbians spend on their smartphones has also increased significantly. Owners now report spending 16.5 hours a week on these devices—an increase of 20% from the 13.7 hours reported in 2014 and 38% from the 12.0 hours per week reported in 2013. 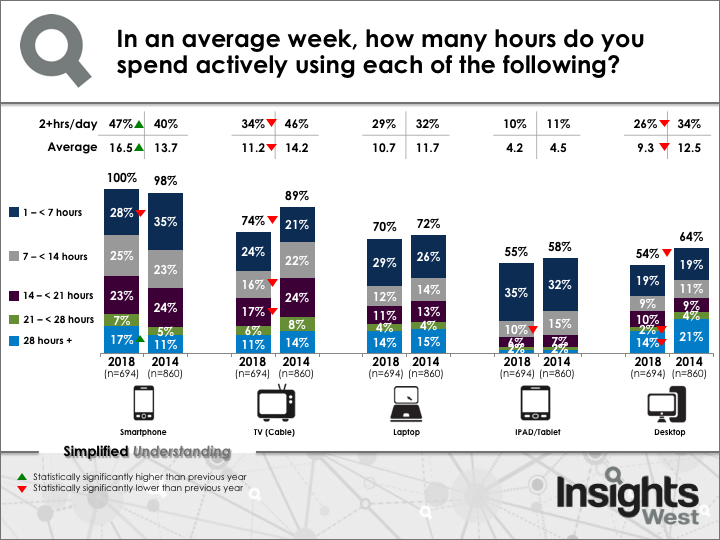 Time spent on smartphones now surpasses that spent on any other device, including TV, which has declined dramatically over the past four years (-21%) from an average weekly usage of 14.2 hours down to 11.2 hours. The 16.5 hours a week spent on smartphones also exceeds the time spent on laptops (10.7 hours), desktop computers (9.3 hours) and iPads/tablets (4.2 hours). British Columbians are using their smartphones for a wide range of activities and, of the fourteen activities tracked, overall weekly usage has increased by about a third. While the more common usages of texting (91%) and email (81%) have only gone up slightly—weekly use as fitness based trackers (30% vs. 16% in 2014) has almost doubled, while activities such as watching movies (21%), online banking (47%), watching TV (16%) and use as a GPS (52%) have seen usage increases of around 50%. Activities such as reading news online (68%), video chat (20%), recording video (25%) and taking pictures (76%) have also gone up by at least a quarter. Many British Columbians have also used their smartphones as a payment method. More than one-in-five have made a purchase through a website accessed with their smartphone (29%, +11), through PayPal (27%, +5), and through apps connected to a credit card (20%, +5), while other payment types such as Apple Passbook (10%), Google Wallet (7%) and Bitcoin Wallet (2%) have been less widely used. While smartphones have, in many ways, made several aspects of everyday life much more convenient, owners also admit to engaging in some behaviours that are generally frowned upon in society. 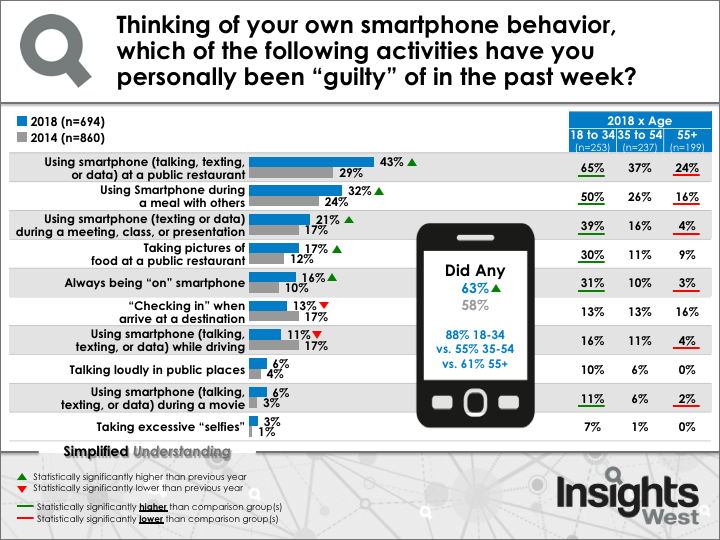 A large minority of Smartphone owners confess to using their smartphones at a public restaurant (43%, +14), during a meal with others (32%, +8) or during a meeting, class, or presentation (21%, +4) within the past week. A smaller number also admit to taking pictures of food at a public restaurant (17%, +5), always being “on” it (16%, +6) and “checking in” when arriving at a destination (13%, -4%). However, one noteworthy exception is that self-reported data on using a smartphone (talking, texting, or data) while driving has decreased (11%, down from 17% in 2014). In general, participation in such “questionable” behaviours has increased over the past four years. What is also very pronounced, is the prevalence of these behaviours among 18-34 year olds—with incidents among this group dramatically higher than other age groups. For example, 31% of 18-34 year olds admit to “always being on” their smartphone and 50% admit to using their smartphone during meals with others. Results are based on an online study conducted from August 3 to 6, 2018, among a representative sample of 816 BC adults who are members of the Angus Reid Forum; of these, 694 are smartphone owners. The data has been statistically weighted according to Canadian census figures for age, gender and region. The margin of error—which measures sample variability—with 694 smartphone owners in BC is +/-3.7%. Discrepancies between totals are due to rounding. Click here to view the detailed data tabulations. Copyright © 2018 Insights West, All rights reserved. You are receiving this email because, as a member of the press, you are entitled to view our latest public opinion polling results. Most interesting survey. Powerful smartphones are game changers. Models such as the Note 8/9 from Samsung are indicative of “peak smartphone”. It is difficult to see what else could be added to noticeably improve these devices. They have massive screens, readable in daylight, terrific battery life, stylus input, and they function with scores of tabs open. News watcher…are you suggesting ‘peak cellphone technology’ puts my 60″ HD TV to shame? Never seen a phone with a “massive screen…” Quality beats convenience for me, with movies/TV and especially music.